'Man-Made Monsters' is the latest addition to a fine compendium of books by Bob Curran about the origins of horror. His popular studies of the undead amalgamate gothic imagery (courtesy of illustrator Ian Daniels) with an academic's eye for historical detail, and colourful story-telling. It's a terrific combination, and this book continues the same formula successfully. Of course, a book on man-made monsters must start in fiction with Mary Shelley's Frankenstein. The author is intrigued by the possibility that there may be a shred of truth to her story. After all, there really was a Frankenstein family contemporaneous with the novel, as well as the Castle that provided its gothic backdrop. It quickly becomes apparent that the experiments that fired Shelley's imagination took place further afield, with the macabre work of such historical figures as Johann Conrad Dippel and Giovanni Aldini. As the use of galvanic electricity was mastered, the dramatic effect it caused when applied to cadavers certainly lent early credibility to the idea that people could be brought back from the dead. In a sense, this has proved true, at least when resuscitating victims of cardiac arrest. However, early experiments with recently hanged criminals proved less successful, albeit very dramatic in appearance. It is evident that some of Mary Shelley's family had direct contact with such experimentation, and it is little wonder then that the creation of a 'monster' was a fear embedded in her time. The book's focus shows that the legends of man-made creatures are often more about the creators than the alleged monsters themselves. Historically, there were many early experimenters who dabbled in this alchemy of life, and Bob Curran does an excellent job of cataloguing their various futile efforts. But the waters are muddied somewhat by rumours of witchcraft and sorcery which swirled around the early pre-Enlightenment men of science. The Church abhorred the concept of humanity creating life (it still does, of course) and the stakes were high indeed (no pun intended!). Further muddying pertains to the Jewish legends of the Golem. The idea went that men might be able to create the semblance of life using an imperfect formula revealed by Yahweh. Eastern Europe appears to have been awash with rumours of Golems fabricated by Rabbis to protect their urban communities down the centuries, and this folklore was still prevalent into the 20th Century. Western Europe also had a history of man-made creatures, although these were more prosaic - such as the animated scarecrows known as Mommets. The narrative of all the stories about these creatures is that the monster breaks away from the control of its master, wreaking havoc, and were driven by a cultural obsession with witchcraft. Alchemy also offered a rich source of fear and loathing about what might emerge from the laboratories of feckless experimenters, and the author investigates this genre comprehensively. It perhaps comes as a surprise, then, that a number of popes were said to be deeply involved in alchemy, and the quest to discover the spark of life (p99). Stories of dark papal secrets were particularly prevalent in the 12th and 13th centuries. Secretive organisations, like the Templars, were not immune to the propaganda of alchemy and sorcery. The theme continues back in the Middle East (from where alchemy sprung and spread to Europe), with the desert ghuuls, or ghouls. Powerful sorcerers known as Kahins and Muqarribun were said to create these monsters that stalked the edges of desert communities. These tales may have been based upon "the wild desert hermits who sometimes may have resorted to cannibalism in order to survive in an inhospitable landscape" (p79). The author does a good job of dissecting the origins of the folklore as he works his way around the globe, ending eventually in China. Themes emerge in this book about our ambivalent attitude towards science. We simultaneously embrace the advantages that new technology has to offer, but fear the loss of control that might result when held in unwise, fickle hands. Such concerns are often well-founded, particularly with regard to atomic science which has left us with a legacy of dangerous waste, and mutually assured destruction. But the actual consequences of medical research into the creation of life has had less significant impact, at least thus far. I would have liked to see Bob Curran delve a little more into what the future may hold for us as science decodes the secrets of life in the coming decades - it would be a natural extrapolation from his historical study, and highly relevant to today's concerns. The field of genetic engineering is writ large across the scientific landscape, and we have no way of telling what monster it may yet create. 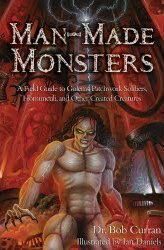 Subtitled "A Field Guide to Golems, Patchwork Soldiers, Homunculi, and Other Created Creatures"